This page list various contact names, web, Email addresses and contact telephone numbers. Anglicized Surnames in Ireland www.libraryireland.com/AnglicisedSurnames/Contents.php If you are not finding an ancestor, maybe the name was changed! Church Records: Roman Catholic, Church of Ireland (Anglican), Presbyterian, Methodist. Birth Date Calculator www.progenealogists.com/birthfromdeath.htm If you have a death date and the age the person died at, in years, months, and days; this calculator will help you find the birth date for the deceased. Big Church Directory www.bigchurchdirectory.com/search.php includes Roman Catholic, Anglican, Baptist, Presbyterian, Methodist, United, Mormon and other churches. British Newspapers 1800-1900 www.newspapers.bl.uk/blcs/ British Newspapers 1800-1900 -Provides a full run of 48 British newspapers. Some of the content is free, but other searches will only provide you with a snippet. However, Latter-Day Saints’ Family History Centre with internet access should have full free access to this database. Cantwell’s Ian Indexes www.iancantwell.com/ Some CD-ROM’s produced by Eneclann, includes some facts about the information on the disks. Catholic Diocese in Ireland www.catholicireland.net/pages/index.php?nd=60 provides a list of counties in each diocese. Coollattin Golf Club, Shillelagh, Co Wicklow. www.coollattingolfclub.com E-mail: coollattingolfclub@eircom.net Tel. No 353 53 9429125 Fax No. 353 53 9429930 A former landed gentry estate which has its own history of tenant farmers, evictions and emigration to the USA & Canada. Today part of the estate is an 18 hole parkland golf course owned by its club members. Database of Advertisements for Irish Immigrants Published in the Boston Pilot www.infowanted.bc.edu/ From October 1831 through October 1921, the Boston Pilot newspaper printed a “Missing Friends” column with advertisements from people looking for friends and relatives who had emigrated from Ireland to the United States. Day of the Week Calculator www.geocities.com/Heartland/Prairie/9714/zeller.htm Have you ever wondered what day of the week an ancestor was born on, married or died? Gary Bastian's calculator will help you with this. Down Heritage Centre: Ulster Historical Foundation, Unit 7,, Cotton Court Waring Street, Belfast. BT1 2ED Northern Ireland. 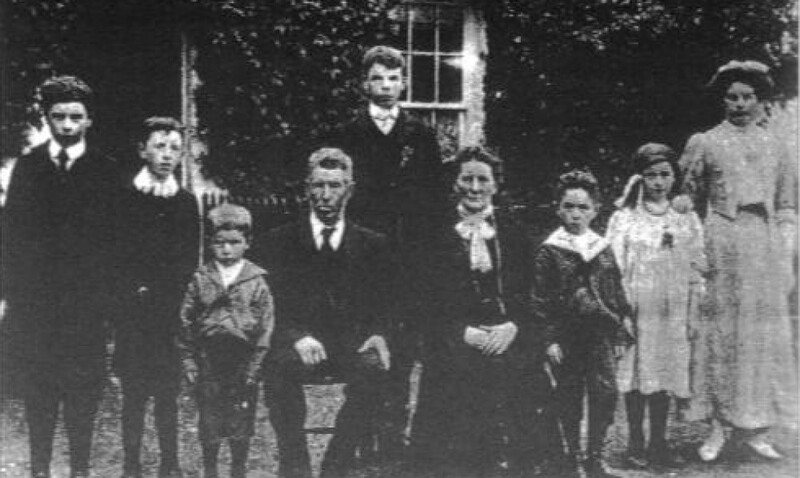 Tel: +44 (0) 28 90332288 Fax: +44 (0) 28 90239885 E-mail: enquiry@uhf.org.uk Website: http://www.ancestryireland.com/ Church Records: Roman Catholic, Church of Ireland (Anglican), Presbyterian, Methodist. Family Search www.tinyurl.com/IrishBMD Family Search.org Digitization Project Includes births 1864-1958, marriages 1845-1958 & deaths 1864-1958. Free Maps of Ireland www.wesleyjohnston.com/users/ireland/map_index.html includes street, historical, electoral, religious, etc. Galway Heritage Centre: History Society Woodford Heritage Centre, Woodford, Loughrea, Co. Galway. Tel: 353 (0) 90 9749309 Fax: 353 (0) 90 9749546 E-mail: galwayroots@eircom.net Website: http://www.galwayroots.com/ Civil Records: 1864-1900. General Records Office. Werburgh Street, Dublin. 2 Tel No 01 8718000 Records of births from 1864, deaths and marriages from 1920s are stored here. Fee paying. Hardiman’s History of Galway www.galway.net/galwayguide/history/hardiman/ online version of book. Irish Family History Foundation www.irish-roots.ie/ Information about some of the approved research centres in Ireland and their holdings as well as finding aids. Irish Family History Research www.irishfamilyresearch.co.uk/ Fee based with a free trial search. Multiple databases to indexes of various subjects. Irish Genealogical Society International www.irishgenealogical.org/default.asp This is an organization based in St. Paul, Minnesota. They have searchable databases for members. IrishTimes.com www.ireland.com/ancestors/index.htm some resources are fee-based. Has a free database for place names and information about them. Kerry has no Heritage Centre but many of the local church records for Kerry were transcribed. See O'Kief, Cosh Mang, Slieve Lougher, and Upper Blackwater in Ireland edited by Albert Casey. 14+ volume. (Available from LDS on microfilm and in some libraries). Kildare County Library, Riverside, Newbridge, Co Kildare. Tel: 353 (0) 45 869065 A large array of historical books, journals and newspapers are held here. Well worth a visit if you are interested in history in Kildare. Latter-Day Saints' Resources www.familysearch.org The Church of Jesus Christ of Latter Day Saints (commonly referred to as LDS) is the largest compiler of genealogy in the world. Their web site offers searches in their Ancestral File, International Genealogical Index, Pedigree Resource File Index, maps, research guides and guidance as well as digitized images from their microfilm collection can be found on this web site. Meath Heritage and Genealogy Centre, Town Hall, Castle Street, Trim, Co. Meath. Tel: 353 (0) 46 9436633 Fax: 353 (0) 46 9437502 E-mail: meathhc@iol.ie Website: www.meathroots.com Church Records: Roman Catholic, Church of Ireland. Northern Ireland Public Record Office www.proni.gov.uk Website provides an online catalogue, along with some major databases, i.e., The Ulster Covenant, Freeholders’ Records, and district probate registries of Armagh, Belfast, and Londonderry. Progenealogists www.progenealogists.com/ireland/resources.htm Professional genealogists who will do research for you. Site also includes some finding aids. Perpetual Calendars www.genuki.org.uk:8080/big/easter/ Calendars for Great Britain from 1550 to 2049, but excludes Scotland for 1600 to 1752. Roscommon Heritage and Genealogical Centre, Church Street, Strokestown, Co. Roscommon. Tel: 353 (0) 71 9633380 Fax: 353 (0) 71 9633398 E-mail: info@roscommonroots.com Website: www.roscommonroots.com Church Records: Roman Catholic, Church of Ireland. Civil Records 1864 to 1900. Sligo Heritage and Genealogy Society, Aras Reddan, Temple Street, Sligo. Tel: 353 (0) 71 9143728 Fax: 353 (0) 71 9135416 E-mail: heritagesligo@tinet.ie Website: http://www.sligoroots.com/ Church Records: Roman Catholic, Church of Ireland, Presbyterian, Methodist. Stewart Tartans www.clanstewart.org to order your own Stewart Tartans visit this site. Bru Boru Heritage Centre, Rock of Cashel, Co. Tipperary. Tel: 353 (0) 62 61122 Fax: 353 (0) 62 62700 Email: bruboru@comhaltas.com Website: www.comhaltas.com Church Records: Roman Catholic, Church of Ireland, Methodist, Presbyterian. Tipperary Heritage Unit, Excel Heritage Centre, Mitchell Street, Tipperary. Tel: 353 (0) 62 80555 E-mail: research@rfhr.org Website: www.rfhr.org Church Records: Roman Catholic Diocese of Cashel & Emly. Waterford Heritage Services St. Patrick's Church, Jenkin's Lane, Waterford. Tel: 353 (0) 51 876123 Fax: 353 (0) 51 850645 E-mail: mnoc@iol.ie Website: www.waterford-heritage.ie Church Records: Roman Catholic. Westmeath: Dun na Si Heritage Services, Knockdomney, Moate, Co. Westmeath. Tel: 353 (0) 90 6481183 Fax: 353 (0) 90 6481661 Email: dunnasimoate@eircom.net Church Records: Roman Catholic, Church of Ireland. Christian, Peter. The Genealogist’s Internet Published by Bloomsbury London. 5th Edition. Directory of Parish Registers Indexed in Ireland. Irish Family History society, 2000 4th Edition. Grenham John. Tracing Your Irish Ancestor. Baltimore: Genealogical Publishing Co., Inc., 2000 3rd Edition. Matheson, Robert E. Official Varieties and Synonyms of Surnames and Christian names in Ireland for the Guidance of Registration Officers and the Public in Searching the Indexes of Births, Deaths, and Marriages. Bowie, MD: Heritage Books, 1995 (originally published 1901). Mitchell, Brian. A Guide to Irish Churches and Graveyards. Baltimore: Genealogical Publishing Co., 1995. Mitchell, Brian. A Guide to Irish Parish Registers. Baltimore: Genealogical Publishing Co., 1988. Ryan, James G. Irish Church Records: Their history, availability and use in family and local history research, Dublin: Flyleaf Press, 2001, 2nd edition.